What happens when a new technology is so precise that it operates on a scale beyond our characterization capabilities? 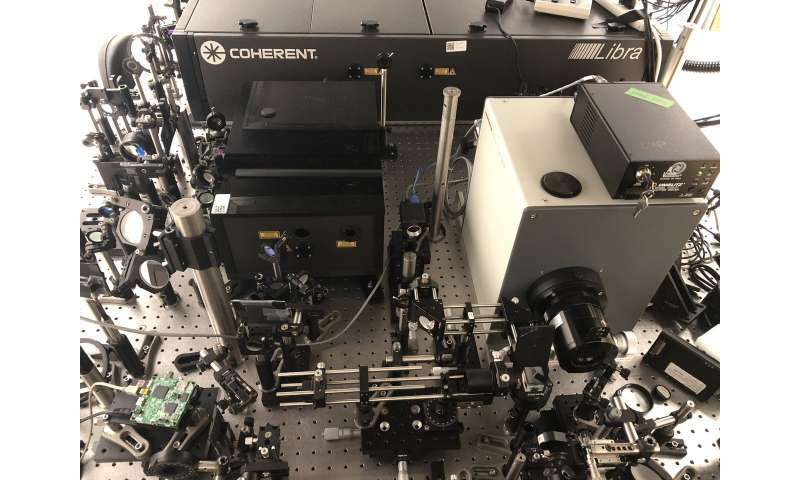 For example, the lasers used at INRS produce ultrashort pulses in the femtosecond range (10-15 s), which is far too short to visualize. Although some measurements are possible, nothing beats a clear image, says INRS professor and ultrafast imaging specialist Jinyang Liang. He and his colleagues, led by Caltech's Lihong Wang, have developed what they call T-CUP: the world's fastest camera, capable of capturing 10 trillion (1013) frames per second (Fig. 1). This new camera literally makes it possible to freeze time to see phenomena—and even light—in extremely slow motion. "but we already see possibilities for increasing the speed to up to one quadrillion (10 exp 15) frames per second!" who needs a super computer for protein folding, just watch it in slow mo on youtube! This is somewhat misleading. While this implementation of compressed ultrafast photography shows a 2 orders of magnitude increase in frame-rate, it is still restricted to light-phenomena itself: eg. spatial resolution of the flight of light-pulses, or the rise and decay of fluorescence in materials. It would not be used for, say, the impact of artificial micrometeorites at 10 km/sec on metal. In short, you wouldn't be imaging (insert irrationally-non-permitted italics here —>) objects. It doesn't image things in action, only temporally and/or spatially changing light phenomena. 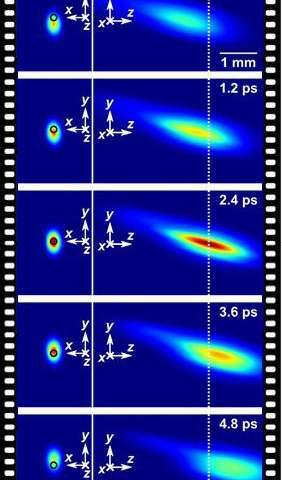 We actually see single photons in flight, a feat these cameras do not appear to posses. This has the resolution necessary to test "spooky action at a distance", even for small distances. Just think about what you wrote there granville. A single rod photoreceptor cell taken from the eye of a frog has been fashioned into an extremely sensitive detector that can count individual photons and determine the coherence of extremely weak pulses of light. Created by researchers in Singapore, the work leads to hybrid light detectors that incorporate living cells. No we don't. We "see" the excitation of rhodopsin by photons. The rhodopsin bleaches when a photon is absorbed, which triggers a cascade of chemical reactions that result in a nervous impulse in the neural network that overlays the retina. This network comes together at the fovea and from there, transitions into the optic nerve which for each eye, bifurcates into a left and right path to the respective hemispheres. In other words, we actually have four distinct optical nerve paths- one each from each side of each eyeball. Well, technically we don't see that either. What we see is a perceptual translation of a mental schemata based on our expectation, experiences, desire, and interest, which is theorized to be caused by multiple brain-based neuronal firing structures. We don't see or sense anything the sensory-receptors detect or how they fire--we sense only perceptions. Such as this could be developed to answer shrodinky's quandary. By using multiple devices with their frame rates offset from each the other as the observers of the experiment, it could be answered how photons move through slits. btw--someone should extend that experiment to include 3 slits, cuz when they move from 1 to 2 the beam is split, but with 3 the original pass thru slit is still where it was. [Maybe they should use a femto laser. Extra credit: How many of you, after reading that I wrote, realized within 10 minutes that it was also a way to increase the frames per second? Want to be the first to do 50 trillion frames per second? Amazing. Most likely an indication our commercial technology such as surveillance cameras and smartphone cameras, etc. will see even greater strides such as resolution in giga-pixels and so forth. Who knows... One day may be able to zoom in to an object from your phone up to half a mile away with UHD clarity. Pixelation may soon be a thing of the past.